Pesaha Appam (Indari Appam) is the unleavened special bread made only once in a year, on Maundy Thursday, by Christians in Kerala. A cross is made on the Indariappam with blessed Palm leaves to denote the holiness of the day. Indari Appam or Pesaha Appam is prepared in Christian households on Passover day in commemoration with the Jewish Passover tradition and for reviving the memory of Last Supper, which Jesus Christ celebrated with His disciples. The head of the family cuts the Pesaha Appam and dips it in Pesaha Paal and serves to all the family members. 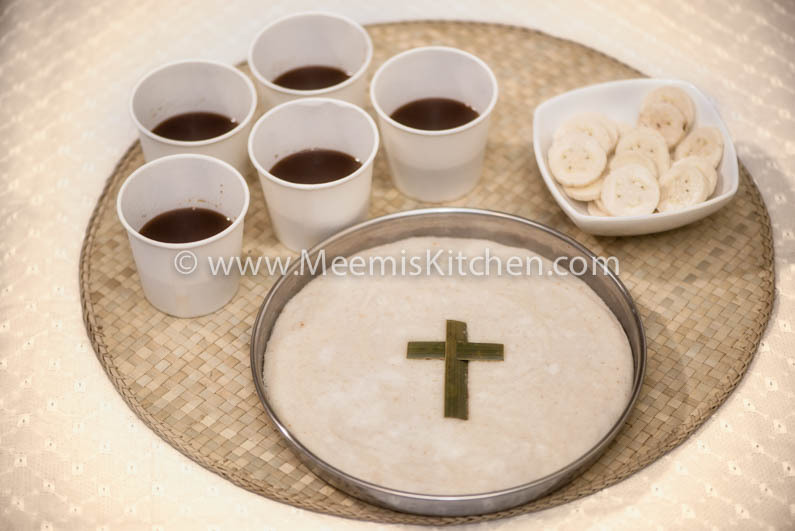 Till recently, I thought only Syrian Christians made Indari / Pesaha appam, but my Latin Christian friends enlightened me that they too prepare Pesaha Appam on Maundy Thursday. Also known as Inriappam, Kalthappam, Indariappam, Indriappam, Pesaha Appam is prepared almost the similar way all over Kerala, with slight differences as per the region. Pesaha Appam is prepared without fermenting; ie., without any yeast unlike the Aval Palappam, Palappam, Vellayappam, Kallappam or Vattayappam. The recipe I have here is collated from both my mommies’ (my mom and mil). I make Pesaha Appam as per my mom’s recipe but with lesser amount of garlic and onions to avoid the severe pungent taste. The Pesaha Paal I prepare is as per mummy’s (my mil) recipe, which is special. The Pesaha Paal is made of Jaggery and Coconut milk and everyone dips the bread in the Paal and have during the ceremonious meal. I have observed that according to region, the preparation is different, although everyone makes unleavened bread without yeast. In some regions, they add coconut pieces (thengakoth) in Inri appam and are served with Banana pieces and Pesaha Paal. You may try all these variations and stick to the one that best suits you. Also check my Easter special recipes, that include Kuttanadan Duck Roast, Tharavu Pepper Roast, Special Fish Molee, Mutton Stew, Nadan Beef Fry and Veal stew and other special dishes. Apart from Pesaha, we also observe Kozhukatta Perunnal and make Kanji on Good Friday. We follow these holy traditions, religiously every year. It is really very spiritual and meaningful to follow these traditions. Every mother should take care to enlighten her children to follow and take part in these traditions, so that they hold all these special moments of love and togetherness in their heart and continue the tradition. As you all get ready for the Easter services, may God’s unconditional love fill your hearts and homes with Joy, Hope and peace. Small onion : 2 – 3 nos. Dry Ginger / Chukku : 1 very small piece. Cardamom (optional) : 1 no. This is a holy tradition followed at all Christian homes in Kerala. Make a small prayer before you start. Boil water, add salt and add the very hot water to rice powder (Appam/ Idiyappam podi) and mix well like you do for Idiyappam (a little more loose). Keep the cross (made of blessed Palm leaves) ready. Soak Urad Dal in water for half an hour. Grind the coconut to a fine paste (add little water) and keep aside. 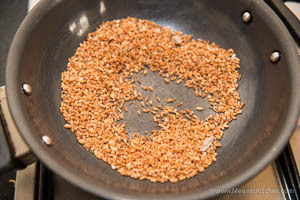 Grind Urad Dal, Small Onions, Jeera/ cumin and garlic together with little water to make a smooth paste. 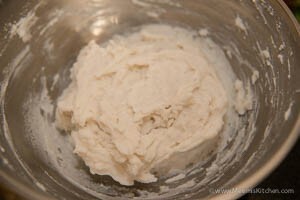 Add the ground coconut and the other paste to the rice flour mix, while it is warm and combine well to form a thick consistency. No more water is required. 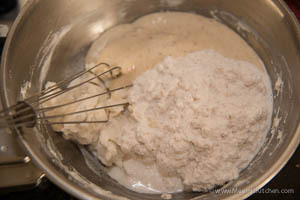 Use a whisk to mix and combine without lumps. Grease a plate and spread the thick batter evenly on the plate and place the cross on top after saying the Lord’s prayer (Our Father..).and making the sign of cross. Do not keep the batter for long. You need to steam it immediately. Cook in a steamer/ Appachembu for 10 -15 minutes. 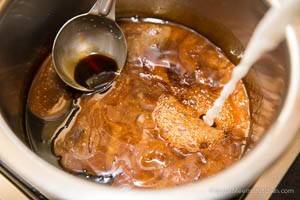 For Pesaha Paal, melt the Jaggery in 1 glass water. Strain and keep in a sauce pan. Wash the rice and drain. 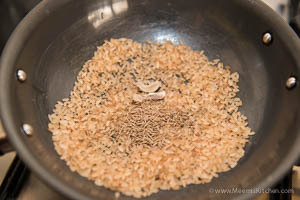 Toast the rice in a dry kadai, together with Jeerah and dry ginger. Stir till the rice pop up. Grind this to a fine powder. 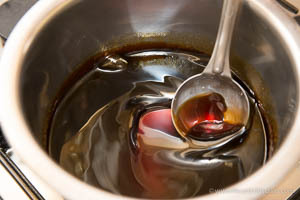 Combine the melted jaggery and coconut milk in a steel pot and stir well. 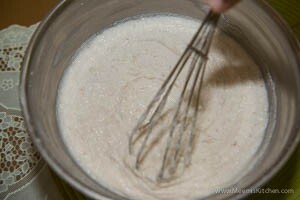 Mix the grounded rice powder in little coconut milk, sieve and add to the mixture and stir well till it thickens. 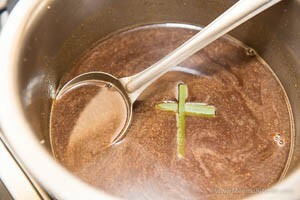 Make a cross with the blessed palm leaf and put into this paal. Lastly add the powdered cardamom and take off from the heat. The head of the family should cut the Appam and dip it in Pesaha Paal and serve to other members after prayers. God Bless!! This is a holy tradition and care should be taken while preparing this bread. Make sure the kitchen is clean before you start. Pesaha Appam and Paal should be made in a new plate/ pot or a plate/ pot which is kept separately for this occasion. 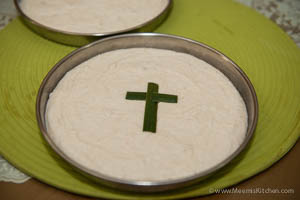 The unleavened Bread or Pesaha Appam is to be cooked immediately after mixing. Do not keep it for long, as it will ferment. 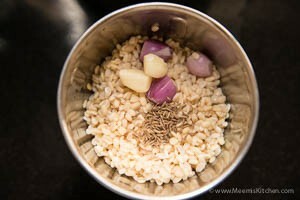 You can add more small onions and garlic as per your taste. Before placing the cross on the batter, say Lord’s Prayer. For Pesaha Paal, instead of frying and grinding the rice , you may add 1 tbsp rice powder and mix with hot water to thicken the Paal. You can cut banana (yelakki/ Njalipoovan) and serve with Paal. Have a blessed Maundy Thursday!! Please share this recipe with your friends and family to keep up the tradition. May God’s abundant mercy and love surround you and your family always! God Bless!